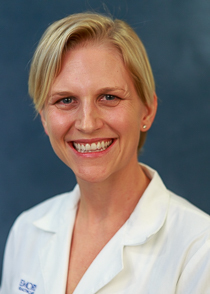 Jacquelyn A. Jetton O'Banion, MD, MSc, joined the Emory Eye Center in January 2016 and will serve as an Assistant Professor in the Comprehensive Service. She brings a solid foundation in public health to enhance our leadership team and support Emory Eye Center’s growing and expanding international programs in global ophthalmology. Dr. O'Banion received her MD from the University of Texas Health Science Center, San Antonio, in 2009. Her residency in Ophthalmology (2013) and a Global Eye Care fellowship (2014) were completed at the University of Oklahoma. She most recently completed a Masters in Public Health, MSc, at the world-renowned London School of Hygiene and Tropical Medicine (2015). Dr. O'Banion's primary practice location will be at the Emory Eye Center and also at the Grady Eye Clinic. She will also serve as the Assistant Director for the Eye Center's Global Ophthalmology-Emory program (GO-Emory). Dr. O'Banion's clinical work will include routine eye exams, cataract surgery and other comprehensive eye care services. Her research interests include pediatric vision screening and improving access to address health care disparity for underserved populations, both locally and abroad. She has participated several studies in underserved populations such as in Peru and Swaziland. Dr. O’Banion is also involved in working with local hospitals, clinics and ministries of health to establish national eye care plans. Dr. O'Banion is a member of the Alpha Omega Alpha Medical Honor Society (inducted 2008, University of Texas Health Science Center, San Antonio); the American Academy of Ophthalmology; and the Oklahoma Academy of Ophthalmology. She has been an invited lecturer speaking about both eye care for the primary care provider and about global eye care opportunities.